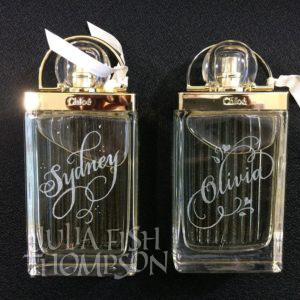 Over the last several years I have done freehand engraving, primarily at Saks Fifth Avenue and Nordstrom. Glass and metal engrave best and the bulk of my work continues to be fragrance bottles. Either the store itself or a particular fragrance line hires me by the hour and customers can have their purchases personalized at no additional charge. I also engrave by the piece in my home studio. I use a rotary tool with a ball tipped diamond bit. I plan my lettering with a permanent fine tipped marker and, after engraving it, wipe away the residual glass dust and marker with rubbing alcohol. If the engraving does not show up very well, I rub a waxy, metallic product into the grooves. I enjoy doing this on the spot and many people find it fascinating to watch.